One of core pillars of the Salesforce1 for Nonprofits model is the ability to communicate with your constituents in a more effective manner. Once you have collected all the information about who your constituents are, how they are connected to your organization, and their interests or preferences, how do you communicate the right message to the right people at the right time? This is where a marketing automation product such as ExactTarget can help you not only communicate more effectively but also help you raise more resources and awareness for your programs or services. The ExactTarget set of tools allows you to segment your constituents and send targeted emails or SMS messages to them. You can also listen to how your constituents are interacting on social media. For example, if a donor tweets about something related to your organization or a topic related to your work, you can respond to them accordingly. Based on a constituent’s action (such as clicking on a link in an email or sharing a post on social media), you can then further target them with follow up messages encouraging them to take a second action (or third, or fourth, or fifth action). You can also create a series of emails or messages to be sent at specific time points. For example, if you have a donor who just made their first gift, you may want to send them a welcome series of emails. You may also want to ensure to include them on specific emails about a program or service they donated funds towards to ensure they remain up-to-date on how their gift is being spent. Since ExactTarget is part of Salesforce’s Marketing Cloud, this allows you to integrate your Salesforce database (for this post I will focus on NGO Connect as a database) with ExactTarget. Did you just host an event and want to send a series of emails to the event participants? Or do you want to send targeted messages to donors who have given over a specific amount this year? With NGO Connect, you can segment your audience through the use of reports or campaigns and then send those segments different forms of communication or a series of communications. 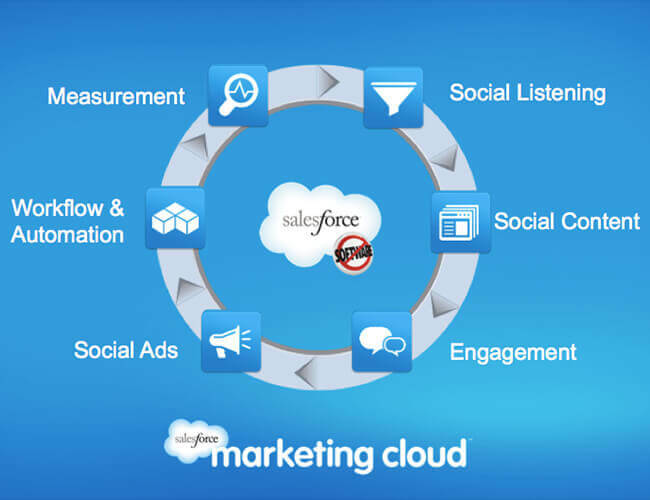 With the NGO Connect/Marketing Cloud integration, you can schedule, send, and review reports on your communications within your Salesforce environment or within the Marketing Cloud ExactTarget environment. NGO Connect will remain your database of record and all the data you are storing in NGO Connect will eventually be integrated with ExactTarget. Currently, any data that is stored in NGO Connect on the Contact, Lead, or Account record can be synced with ExactTarget. This means you can send personalized emails (gone are the days of “Dear Friend”) and also ensure that a constituent’s contact information is up-to-date by asking your constituents to review their email, phone, or mailing address information. Similarly, all of the data on new subscribers, unsubscribes, and resubscribers is also synced from ExactTarget into NGO Connect so you won’t have to worry about sending an email to someone who has unsubscribed from your list. While the ExactTarget integration is currently in its 5th version, we have a lot to look forward to. In the Spring 2015 ExactTarget release, we hope to see custom objects also integrated between NGO Connect and ExactTarget. This means that information on your constituents salutations, preferences, giving, membership, etc. can all be synced with ExactTarget. This will provide an even stronger ability to send the right messages to the right people at the right time. Further down the road, we can look forward to even deeper integration between these two products such as the ability to have a donation form pre-populated with a donor’s contact information after they receive an email from you and click on a donation link. We’ll also hope to see the ability to direct traffic to different locations or landing pages after a user takes the first desired action such as making a donation or signing up for a membership. NGO Connect and ExactTarget are two very powerful tools both of which can enable your organization to raise more funds and further your mission. The integration between the two will only continue to deepen which leaves me very optimistic at the power of effective communication on the nonprofit sector.